Pioneers in the industry, we offer Jeep Grand Cherokee Summit Cars, Grand Cherokee SRT Jeep, Wrangler Unlimited Jeep, Compass Car, Grand Cherokee Car and Grand Cherokee SRT Car from India. The sophisticated Summit model features a sumptuous and inviting interior with premium Nappa leather-trimmed heated seats with edge welting, a refined suede-like premium headliner and exotic open-pore wood accents with distinct copper trim or chrome trim accents. Our commitment to excellence carries over to the leather-trimmed instrument panel door, center console, shifter knob and armrest. The Grand Cherokee exceeds its reputation as one of the world’s most luxurious SUVs. It carries the Jeep® brand legend of capability, arriving in a right-sized package, with one of the most beautiful interior designs. Made for epic performance, on and off-road+, Grand Cherokee is eminently capable–all the way down to its wheels and tyres. Available in 50.8 cm (20) and 45.72 cm (18) sizes, Tyre Pressure Monitoring Display is standard on all models. The 3.0L CRD Turbo V6 Diesel engine is a refined powertrain that provides optimum efficiency and low CO2 emissions without sacrificing performance. 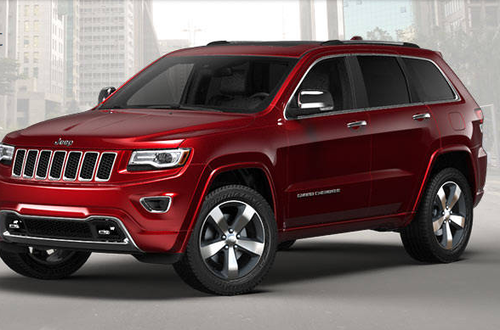 Combined with the advanced eight-speed automatic transmission, the Jeep® Grand Cherokee can deliver up to 12.8 km/l. The 3.6L Pentastar® V6 Petrol Engine offers 289 PS Power and 347Nm of Torque. It provides innovative technology that is efficient and improves power—all while giving you a power packed performance. The exceptional eight-speed automatic transmission provides fuel efficiency, quick acceleration and smooth shifting. It also allows for a crawl ratio of 44.1:1 to aid in off-roading (when equipped with a two-speed transfer case). Selec-Terrain® traction control system, giving you mode of Select terrain and Quadra track II to tackle weather conditions. Behold the most powerful and technologically advanced Jeep vehicle ever built. Grand Cherokee SRT reflects an aggressive profile that gives a clear indication of the capability and power that lie within. Heads will turn on the road and on the track. Superior performance combined with ultra-premium luxury makes the Grand Cherokee SRT unique. Born of a heroic past and driven to deliver your most memorable tomorrows, Jeep® Wrangler Unlimited stands ready to put you in touch with the real world. The Wrangler Unlimited provides ample storage space with thoughtfully designed ergonomics to protect you from noise, vibration and harshness. Enjoy the comfort and convenience of Wrangler with refined features including available heated, leather-trimmed front seats, illuminated cup holders, lighting in the footwell and an auto-dimming rearview mirror with integrated LED map lights. Wrangler brings a range of communication and entertainment services straight into your vehicle, all bundled together within a robust UConnect® system- with many convenient available options. PHONE: Safely make calls with a hands-free phone call. Pair up to your Bluetooth®-enabled phone and use voice commands to speak with your dear ones while you enjoy the drive. This clever system is smart to synchronize your phones contacts (up to 1000 contacts). NAVIGATION: Go in the right direction with Uconnect® and its enhanced GPS way finding systems. The Uconnect 735N media center with enhanced GPS navigation and destination entry via voice command. Find a local restaurant or attraction and get directions with a simple request. VOICE COMMAND: It simplifies driving by letting you keep your eyes on the road and your hands on the wheel. Use your voice to select radio stations or make calls. Choose this diesel-powered engine for your Wrangler and you'll be supported by 147 kW (197 hp) at 3600 rpm and 460 Nm (339 lb-ft) of torque at 1600 – 2600 rpm. By: Renault karnavai Parklane Auto Pvt. Ltd.